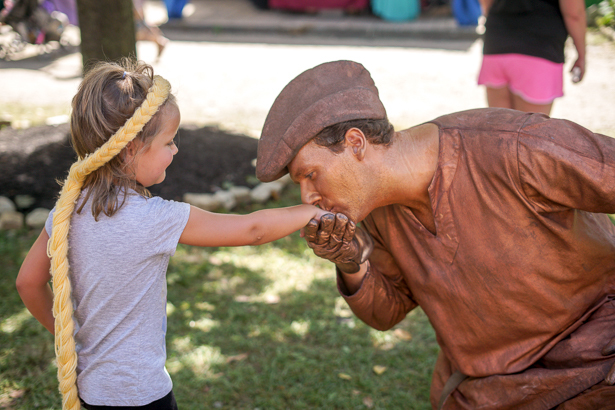 The Ohio Renaissance Festival is a unique way to learn some history and have some family fun! Held each fall just North of Cincinnati it’s a perfect family day trip with the family! With all the princesses, knights, games and slightly adult humor, it’s a great fit for all! Before going it’s important to check their schedule as each weekend is a different theme! Hours run 10:30-6:00 PM WEEKENDS ONLY! 5 tips to know before you go! Bring plenty of cash as most places only take it (Parking, for instance, is $3 CASH). There is an ATM but every one we passed had long lines. Don’t be afraid to haggle! We scored 2 *magic* wands for $15 instead of $20! This is the perfect time to wear those princess dresses and other costumes! This goes for kids and adults! Tip the vendors! By dropping in a couple of dollars here and there we were granted some stellar photo opportunities! They ask that you not bring in outside food or drink so we started out our day with a picnic in the car before we went in. There is an easy stroller access--though it can be a bit crowded. If you purchased a ticket beforehand you can skip the line and walk straight up to the entrance. When we went, the line to buy tickets had at least an hour wait making it completely worth it to buy online! To enter, you walk through a castle and immediately you travel back in time! My kids were speechless as they looked around seeing so many beautiful costumes! Be sure to grab a map as it can be invaluable when a sudden bathroom stop is required! 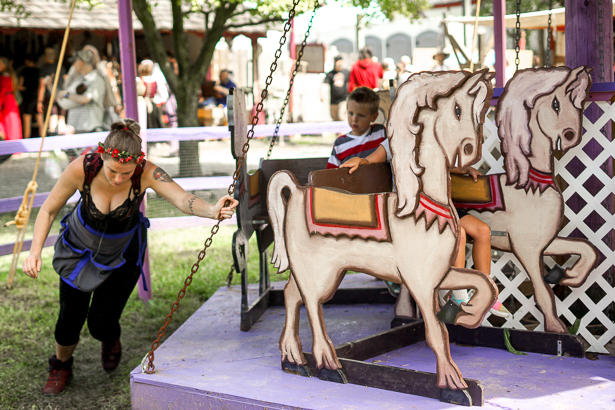 Our first stop was the 16th-century, merry-go-round which was completely human-powered! It was so fun to see how carnival rides used to operate! Pricing for this ride was $4 each which isn’t bad a bad price considering someone has to push you around! Next, I had the kids put $1 each in a bucket next to the copper statue who then surprised them by asking for a fist bump! One of my favorite photos of the day came from meeting him! We continued exploring the village, stopping when we saw anything of interest. 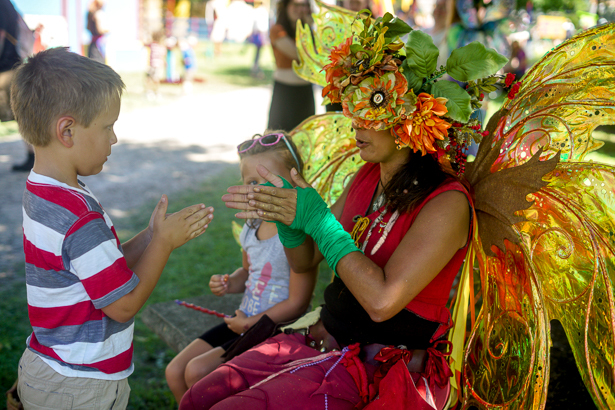 The kids picked out magic wands as their souvenir and stopped to see a parade of the vendors. The music was fun and we even caught a glimpse of the queen! Spark the fairy can be found in the games section of the village. The games do not take cash. Instead, you have to buy tokens and use them instead! Spark is quite a site to see. Her wings are very large and intricate. She is available for pictures and will also give the kids a fairy gem and show them how to release the magic! We spent a lot of time looking at the knives and swords. The vendors were gracious and were happy to show off their wares to the kids (as long as they were careful to not touch!). If you don’t have a costume, don’t worry! There are plenty to be bought here! From crowns made from garland to elven tiaras, there is plenty to choose from! Last, there are even photo opportunities for the big kids. 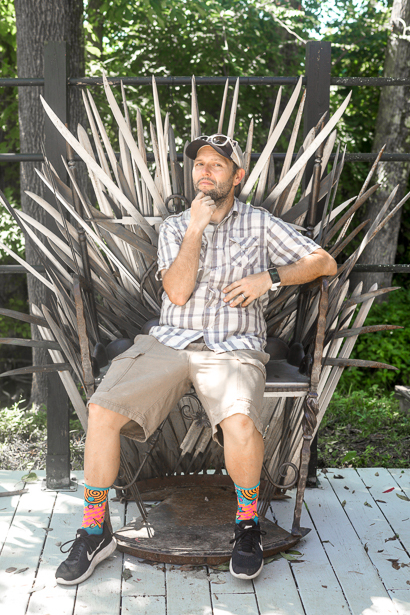 As shown by my husband and his pic “casually” lounging in the Iron Throne. 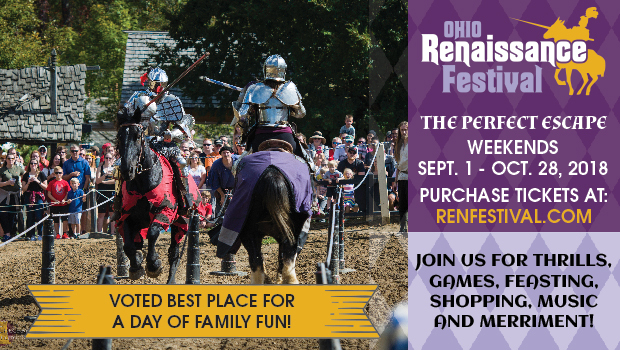 So, if you are looking for a fun and family-friendly day trip Ohio Renaissance Festival is the place to be this fall!